Rosehip Oil 100% Pure: Unrefined Pharmaceutical Grade “A” product is Unrefined, which means it is in the purest form that it can possibly be in. 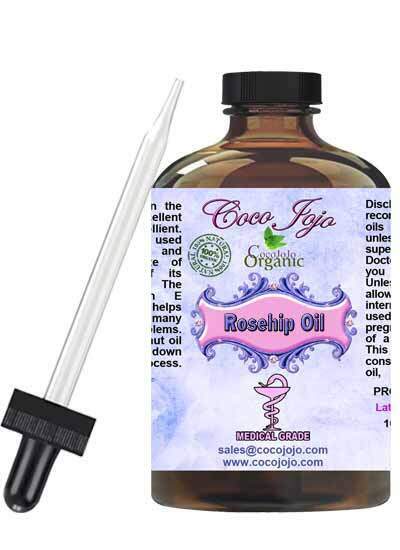 Rosehip Oil 100% Pure: Unrefined Pharmaceutical Grade “A” comes from the seeds of a specific variety of rose, Rosa aff. rubiginosa or Rosa moschata. A cold-press extraction method separates the oil from the hips and seeds. The delicate oil needs refrigerated or stored in a cool, dark location to prevent rancidity. For facial skin care, rose hip oil offers several benefits when applied externally due to its primary constituents: essential fatty acids, vitamin E, vitamin C and B-carotene, a form of vitamin A. The essential fatty acids in rose hip seed oil can help improve skin flexibility and permeability. Emollients also aid in skin help. Vitamin A may also play a part in rose hip oil’s help to improve skin texture and tone.